Sometimes I forget just how lucky I am to be connected to the Farmer’s Fresh Market. Not many (although the numbers are growing) people get their produce the day after it’s picked. Think about it… the produce sitting on the shelves of your local grocery store probably traveled better than 1000 miles to get there. It was picked long before its peak. It languished in a distribution center somewhere. It rode on gas guzzling trucks for who knows how many miles! Every day I am thankful that I sat down one Wednesday morning with the local paper and read the article on the Farmer’s Fresh Market. I am glad I drove from one side of town to the other to check out the produce that came in the Urban Box. I remember cooking up the contents of the first box… corn and leeks that tasted like the epitome of summer. A tomato sandwich that made me weak in the knees. 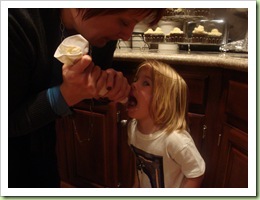 It’s the highlighted picture on my blog… I still dream about that sandwich! There’s something really special about having a connection to the land where your food comes from and to the farmers whose lives are dedicated to growing and tending it. Today, I only shop the produce aisle at the Harris Teeter for those few things I need to fill the snack bag, grapes and bananas usually. And I even feel guilty for that! I’ve come to depend upon what’s local AND in season to nourish my family, and we are all the better for it! To learn more about the Farmer’s Fresh Market, please (PLEASE) watch the video below! 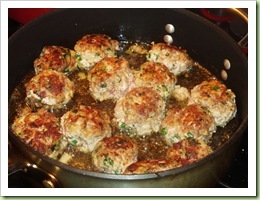 Ricotta meatballs – thanks Dena for pointing me in the direction of this recipe… they came out awesome! You can find the recipe here! Here they are getting nice and brown… notice the change in pan. I need to remember to make meatballs in the non-stick skillet. 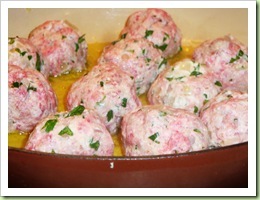 While I love my le cruset… meatballs get stuck there a little too much! Simmering away in the sauce. I came across a great way to make marinara that is so quick and easy, but tastes like’ it’s been cooking forever. Smash about 6 garlic cloves and put them in the pot with about 1/4 cup of olive oil. When they start to get nice and toasty brown (but NOT burned!) 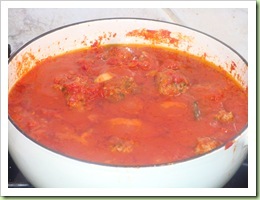 add two cans of crushed tomatoes and a 1/2 teaspoon of oregano. Let simmer for a bit then add a few basil leaves to the pot and taste for salt and pepper. My lovely Daikon radishes. 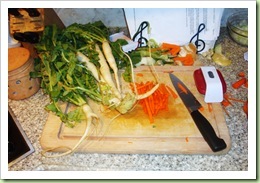 Sliced into matchsticks along with some carrot to make a quick salad to go with the Vietnamese sticky chicken below. 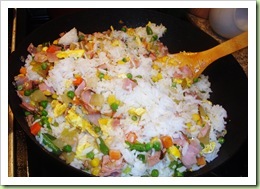 Fried rice as a side, one of Josh’s favorite meals! This is the recipe I’ve used for years! 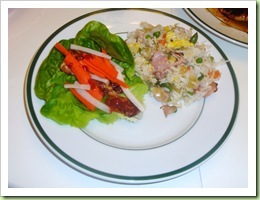 Served lettuce-wrap style with a little Siracha to make it spicy!! Chocolate-Guinness cupcakes with vanilla butter cream frosting! My sister in law Kim gets props for the beautiful frosting effort. I can’t frost a cupcake to save my life! Ebie gets the left over frosting! 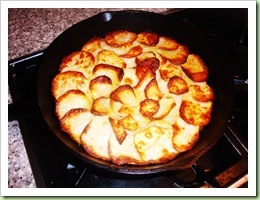 One of my favorite potato dishes. 3 ingredients: potatoes (I used the awesome Kennebec potatoes from my produce box), butter, salt. 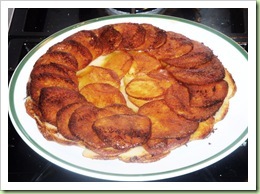 Slice potatoes about 1/4 inch thick – using a mandoline makes this SUPER fast. Then melt some butter in the bottom of a cast iron skillet and start layering your potatoes/butter/salt. 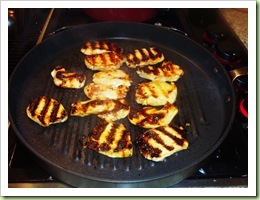 Get a good sizzle going and then pop it in a 450* oven and cook for about 45 minutes. It comes out golden brown like this. Then flip it out onto a dish and you have these beautiful golden/crunchy potatoes on the top, and soft, buttery potatoes on the inside. I served it with a ribeye steak and some creamed spinach. TO DIE FOR. I have a LOT of produce. My refrigerator is overflowing with fresh vegetables. For some reason, I just have not cooked my way through the goodies as quickly as I have in the past. So, as I was taking inventory of my refrigerators (yes, there are 2) I realized I needed to do some menu planning. And I am REALLY excited about using some of these goodies… especially the radishes. So, here’s what’s on tap for the next few days… I’ll post pictures and other ideas as I start cooking. First of all – I have a ton of eggs and I’ve been dying to using those broccoli sprouts from a couple of weeks ago. I saw a lovely picture of an egg salad sandwich with some sprouts on it a few days ago, so I think that will be our lunch tomorrow and maybe Saturday. And back to those radishes, first I have a bag full of daikon radishes, which I’ve never used before. I scoured and scoured the internet for some ideas, and have decided to give this one a try – seems pretty straightforward, and we all love Asian food so it should hopefully be a success! I’ll post a picture upon successful completion! And for that beautiful bunch of mixed radishes that came in the box yesterday – I cannot wait to put those to use. I found a most unusual sounding recipe and I can’t wait to try it (we’ll see what the family thinks). It will also help to use up some zucchini and put my basil (that’s still thriving in the garden) to good use. 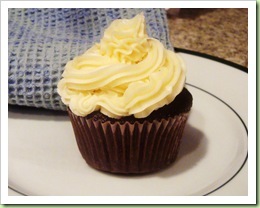 And on a non-vegetable note, I found a recipe for chocolate Guinness cupcakes with vanilla butter cream frosting. YUM! 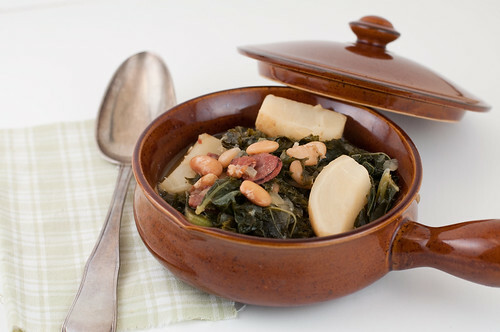 This is also looks really good… can’t wait for some kale to arrive in my box! Arugula, Tomatoes, and Chicken… OH MY! What to do with a bowl full of tomatoes, fresh arugula, and a pasture raised chicken? I found a pasta dish on epicurious.com that I thought sounded really tasty, but improvised just a little bit. I cored and halved the tomatoes, tossed them with some sea salt, a bit of sugar, and some olive oil, and roasted them at 500* for about 40 minutes. Then after they cooled, I peeled and chopped them (but left them in all their yummy juiciness). I broke down my little chicken into 4 piece and sprinkled those with some sea salt, pepper, and olive oil and roasted those at 375* for about 40 minutes (leaving the skin on/bone in results in really juicy chicken!). To make the sauce I sauteed few cloves of chopped garlic with some red pepper flakes in a bit of olive oil, then added the chopped tomatoes and their juice. Added all the chopped up chicken, a splash of chicken stock, and ended up with a delicious (and light) sauce. In a big bowl I tossed the arugula, chicken/tomato sauce, feta and pasta together. What a delicious dinner! Even the kids loved it (minus the arugula… but I’m working on that!) Sorry, no picture, I need to charge my camera! 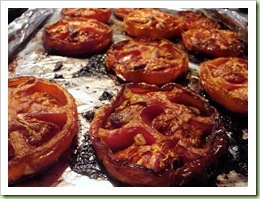 And because I still have a big bowl of tomatoes left, I’m going to roast some more today, and use as a base for this recipe… which I plan on serving as tacos, instead of an appetizer.